School starts in less than two weeks up here so I've been doing the mad dash to get the smalls ready for some scholastic arse kicking. And by doing the mad dash, I mean sitting here at my kitchen counter, twittering while playing some lame strategy war game that someone linked to on twitter. I will never again yell at my husband or my children for getting sucked into some stupid computer strategy game. Twitter. The world's greatest time waster. I really need to stop clicking links that show up in my stream. I'd be much more productive then. Yesterday, however, unlike today, I was actually feeling productive. (Probably because I tried to stay off of twitter. See how that works?) My daughter and I took the city by storm, emptying out my bank account and filling her closet with new purchases. She walked out of the stores happy; I walked out slightly shell shocked by what passes as acceptable clothing for young teenaged girls these days. Along the way, I picked up the boys a few things and was ready to call it quits for the day when my daughter suddenly stopped and exclaimed, "Mom! We need to get Jumby a new lunch box!" So the great lunch box search began. I'm a bit of a fussbudget when it comes to Jumby. I admit I tend to spoil him rotten. Maybe it's because he's my baby, maybe it's because I'm trying to make up for the five years he had to live without his family, or maybe it's because I clearly have too much time and money on my hands. Either way, the boy is spoiled. I can live with this. I'm pretty sure he's okay with it too. As my daughter and I searched for lunch boxes that met my requirements (metal, big enough to hold his medical supplies and thermos of liquid food, and most importantly, cool looking) my husband called. "Lunch boxes. Trying to find something cool for him." "You do realize he can't see whatever box you choose, right? That this is more an exercise for you?" My husband is very helpful with his armchair psychology. "Whatever. It sits on my counter for an entire year. It has to be something that doesn't make me want to stab anyone every time I look at it." "Well okay, but no skulls. I'm sick of skulls. If that kid could see, he'd have nightmares from all the skull stuff you buy him." "First off, skulls were cool. Last year. He had that whole tough kid image going on. But we've moved on. I'm thinking retro this year. Like Jem and the Holograms." "Fine. He-Man then. By the power of Greyskull!" I exclaim, slightly louder than I intended. My daughter cringed and walked further away from me. By gones. "You married me. Which makes you a dork lover." 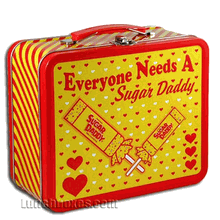 After hanging up, I returned my attention to finding the perfect lunch box for Jumby. There were a couple of contenders but nothing jumped out at me like last year's lunch box. And then I saw it, tucked in behind a bunch of Superman lunch kits. "Hey Fric, what do you think of this one?" I asked as I held it up. "Um, it's ..." She fumbled for the right words. "It's AWESOME!" I finished for her. "I think we found a winner." "But mom, I really think Dad would like this one better," she countered while holding up a green lunch box with Kermit on it. "Ya that's cute too but this is better!" Kermit's cute but he has no edge. "I'm not sure it's appropriate for a second grader. I think you should ask dad his opinion first," she whispered. "Oh please." But then I thought of my husband rolling his eyes at me when he saw it and lecturing me about trying to recapture my youth through our youngest child so I figured what the heck, I'd just send him a picture via text. "He's going to say no, Mom," my daughter warned me as I pressed send. "You really think so? I think it's awesome!" "You say the word 'awesome' a lot Mom." "Because it's totally awesome. Like gnarly awesome. You're just too young to have developed a rad lexicon like I have. Don't worry, it'll come with time." "Oh, AWESOME," she said as she rolled her eyes as my phone vibrated. In all caps, my husband had texted, "PUT IT DOWN, WALK AWAY. NOT ON YOUR LIFE. HE'S 7. NOOOOO." My daughter, reading over my shoulder, chuckled and said, "I told you so." I looked at my coveted lunch box and sighed heavily and sadly put it back on the shelf. "Fine. We'll go with Kermit. 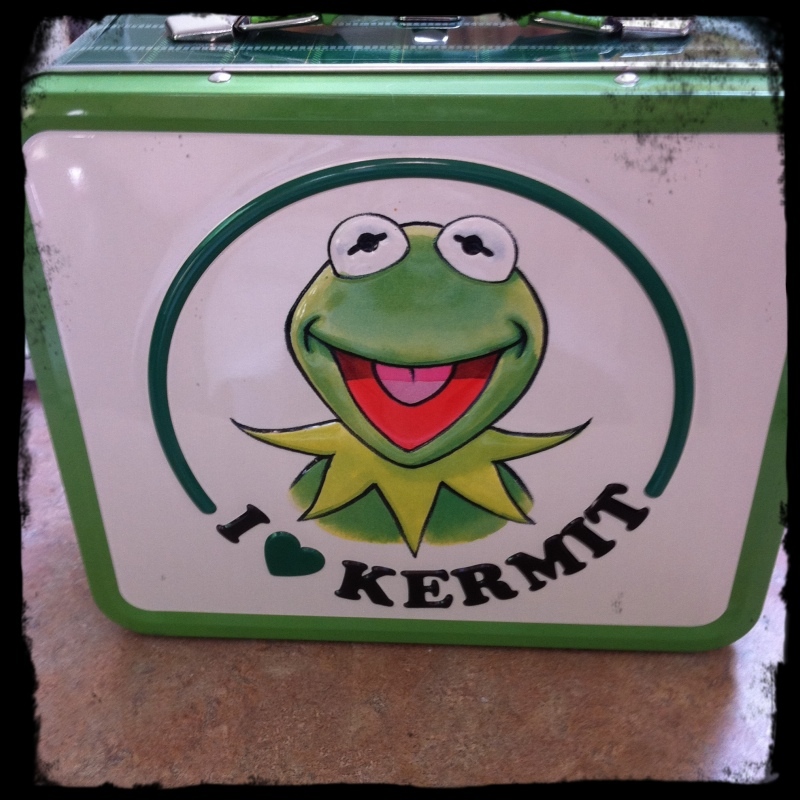 But for the record, Kermit will never be as cool as that lunch box." "Whatever Mom," she said as she walked to the register to go pay for Jumby's new container. Apparently, someone has to be the responsible parent who makes suitable tasteful choices for their special needs child. Equally apparent, that person will likely never be me. I still think this lunch box is better than stupid Kermit. Now excuse me, I'm going to drown my lunch box woes in an online game killing trolls while stalking twitter. Again. Like the responsible parent I'm not.